Add a touch of dynamic art to your garden with this kinetic, glow-in-the-dark sculpture. 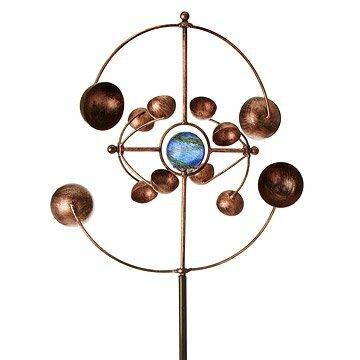 This kinetic metal sculpture brings the wonders of the galaxy closer to front yard. An active cosmos of independent yet intertwined parts, this way-out piece harnesses nature's power, turning the sun and wind's everyday effects into dynamic art. As the breezes gently blow past the piece, the metal cups orbit in opposing directions around a delicate glass globe, creating a mesmerizing, celestial scene. Crystals from the hand-blown globe shimmer in the daylight as they absorb energy from the sun. At night, the crystals suspended in the globe release as a celestial green glow after dark that'll attract stargazers at summer soirees and will even glow in the winter, thanks to its durable, electroplated antique copper finish. Made in China. Do not subject to freezing and thawing. Unit will charge in 5 minutes if left in direct sunlight (late afternoon sun being the best) or under incandescent light and will glow up to 4 hours. For best viewing it is recommended not to put near non competing light sources i.e. landscaping lights, street lights or interior house lights. Small spinner cups will need to be hit with direct winds of 15 mph or more in order to spin while large spinner cups will spin more freely. Purchased as a gift......they loved it! I have a wind spinner from Uncommon Goods and have loved it! And now our friends will have the same enjoyment. I love how interesting the spinner is to watch. I'll have to see how well the finish wears in the elements. Quite attractive, but one of the small rotors is so unbalanced that it won't spin even in very heavy winds. It adds interest and color to the garden. Is a talking point for friends. It moves easily in a light breeze, but we bring it inside in adverse weather. Many people say "where did you get it?" and I give them your web site. We have had this in our yard for a few months now, and it is a lovely product that spins beautifully. However, it did not take long for the joints to begin to rust and become unstable. Tried adding some outdoor clearcoat lacquer early in the process to stop the rust from getting any worse, but it unfortunately did not work. Maybe not the best for locations with a lot of salt in the air...? Bought this as a gift. Looked great out of the box, but it wouldn't soon as some of the arms hit each other as they rotated. Don't know if it got bent in transit, but the arms are supple enough to bend a little to allow for free movement. Hope this doesn't cause problems or point to short lifespan of the product in the future. Great bit of personality for the garden! Looks great in our garden! Wanted to add sculptural interest to garden. This piece is beautiful and fun to look at. I had hoped it would be a little bit taller, but as it is, it's still really nice. This was a gift for my husband and he loves it, which is really all that matters. Pretty to Look at but doesn't rotate as designed. I am very disappointed that the two parts do not rotate as described. The only time I saw the bottom half of the spinner rotating (for a very short time) was during a heavy wind storm. So the bottom stays stationary for most of the time while the top spins.